The DfT says the bids for the East Midlands, South Eastern and West Coast franchises were “non-compliant” because they did no meet pensions rules. Bidders for the franchises have been asked to bear full long-term funding risk on relevant sections of the Railways Pension Scheme, Stagecoach said. Mr Griffiths said conditions put on franchise bidders are “more evidence that the current franchising model is not fit for purpose”. Stagecoach had bid independently for the East Midlands franchise, had intended to partner with Alstom for the South Eastern operations, and was jointly bidding for the West Coast Partnership with Virgin and SNCF. Stagecoach shares fell almost 10% in early trading. 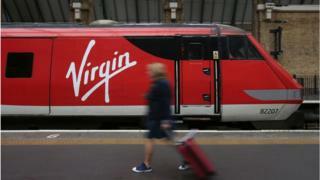 A DfT spokesman said that other bidders had met its requirements, and also announced that the East Midlands franchise had now been awarded to Abellio “after they presented a strong, compliant bid”. He said: “Stagecoach is an experienced bidder and fully aware of the rules of franchise competitions. It is regrettable that they submitted non-compliant bids for all current competitions which breached established rules and, in doing so, they are responsible for their own disqualification. While Stagecoach has played an important role in the UK railways industry, “it is entirely for Stagecoach and their bidding partners to explain why they decided to repeatedly ignore established rules by rejecting the commercial terms on offer”. Rail companies that lose franchise battles are normally reluctant to complain too loudly. It’s a long game and there is always another franchise tender coming up, so why alienate the government department that hands out the goodies? This morning Stagecoach shattered that conventional wisdom, rubbishing the Department for Transport’s decision to exclude it from three bids. Stagecoach had refused to shoulder the long-term pension liabilities, knowing that the pensions regulator has warned that more cash will needed, but not knowing how big that bill might eventually be. It’s an entirely understandable position – why sign up to something over which you have no control, and might, if pension liabilities follow their recent trends, turn out to be a big blank cheque? Stagecoach has a painful recent memory of getting a franchise bid wrong. Walking away from the East Coast line cost it £130m, and it cannot be in any hurry to put itself in a similarly risky position in the future. Other bidders do not appear to share its qualms. Abellio, owned by the Dutch national railway, has won the East Midlands franchise. South Eastern, the biggest of the three up for grabs, has been put on hold with an extension of the existing contract. The third, on the West Coast line, will be announced in June. Despite Stagecoach’s protests, the DfT says it has “total confidence in our process.” Given the recent chaotic nature of business on the railways and DfT’s handling of the Seaborne freight contract, that might turn out to be a bold statement.